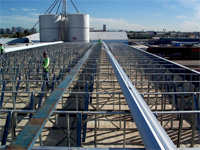 A Retrofit Metal Roofing System is durable, versatile and energy efficient. In all aspects a sloped roof outperforms a flat roof. 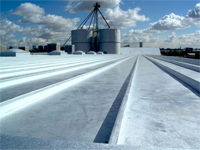 Typically the flat roof encourages the pooling of water which can lead to clogged internal drains, and corrosion which substantially increases maintenance costs. 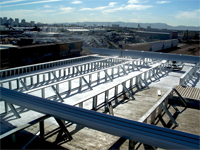 A Retrofit Metal Roofing System eliminates pooling problems and their costs. Upgrading an existing roof is a cost effective solution not only in construction, but a substantial savings in maintenance costs as well. 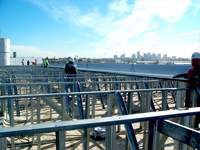 Retrofit Metal Roofing Systems can be customizable to include solar panels. 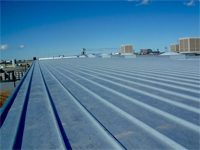 Retrofit Metal Roofing Systems are the perfect solution to change the look of an existing structure without the cost and chaos of demolition and tear-off. 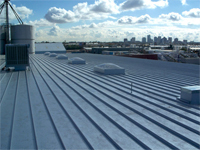 Retrofit Metal Roofing Systems are lightweight and provide weather-proofing to your existing roof. For the best customizable metal roofing solution for your building, contact Ultra Seam at 1-800-874-7326 or send us your inquiries on this form.